Rapid technology disruptions, high customer demands, and gaps in staff skills to address both, are some of the crucial challenges most digital marketers face today. With so much energy going toward these in-the-moment needs, it can be easy to lose sight of your future plans, much less any sense of progress toward a mature digital presence. What are key steps to consider when adopting customer-centric business objectives? 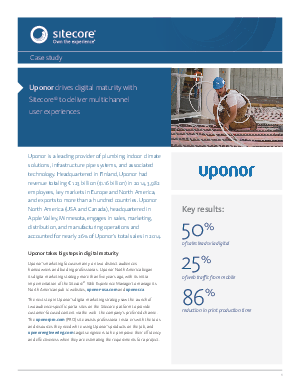 In what ways has Sitecore been a sustainable platform for Uponor’s digital growth? What methods can you use to develop your organization's digital vision? Start on the road to marketing maturity!